Possibly the only thing that makes winter weather feel colder is wrestling with a frozen, dirty leather halter to get your horse settled for the night. That, and the chilling sound of frozen poo hitting the muck basket. We can’t help you with the frozen horse poo but we can help with the super-stiff turnout halter. One of the many advantages of a beta biothane halter or bridle is that no matter how cold it gets, the material does not freeze or grow hard, and it doesn’t require any oil or conditioning to maintain. Our shop carries beta products in a range of colors and styles, so even if you just pick up a beta turnout for the coldest months of the year, your horse can stand out in the crowd. Learn more about beta here. Yup, it’s wintertime again. The season of frozen poo, frozen arenas, and blanket changes. In case you can’t tell, we’re not huge fans. We do try to keep working through the winter though when there’s nothing polar going on outside, which is why we found this article from The Horse magazine so interesting. Experts discuss the best strategies for properly cooling a horse out and making sure they’re ready for their blankets before going back into the field (tip: their coats should be totally dry first). 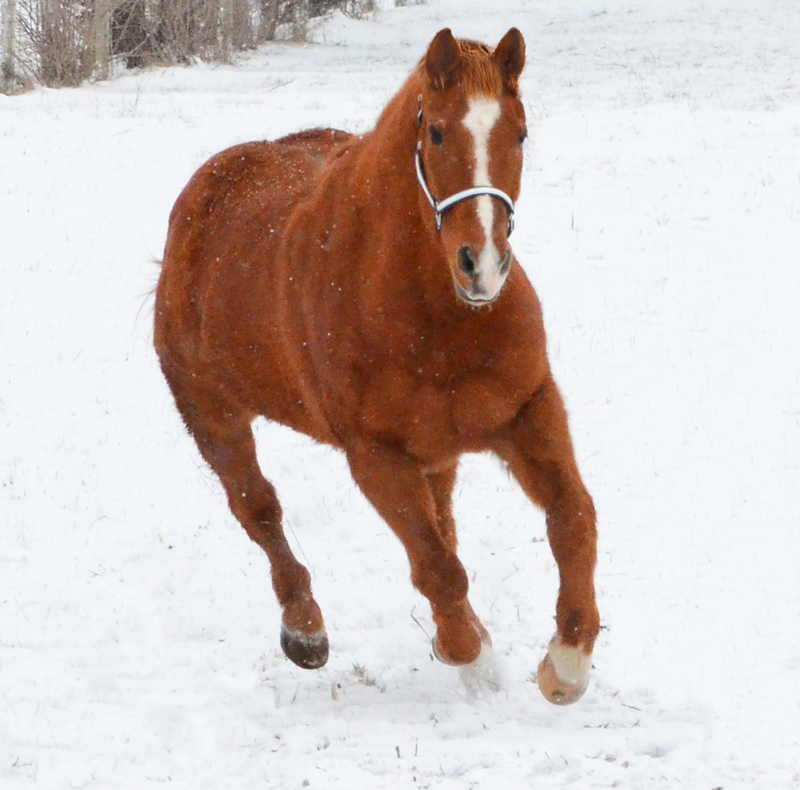 Colder weather can tighten muscles and aggravate arthritis, so we were interested in their suggestions about warming horses up and cooling out slowly in colder months. Take a look for yourself. We love riding with stirrups. Don’t get us wrong–we’re pretty sure there isn’t a rider on the planet who’s happy to hear their instructor tell them to drop their stirrups and begin trotting at the start of a lesson. But after riding in a lot of different saddles over the years, we’d identified a few problems with a lot of them. First of all, stirrup leathers tend to stretch over time. As the length of the material expands, the level of the buckle also moves down–especially if you ride with your stirrups at the same length for a long period of time, which most of us do. Even though the stretching might just make the difference of a few fractions of an inch, keep in mind that most English stirrup leathers are set with holes just an inch apart, and yet you can feel a big change if someone else has adjusted them. And what about that–why do all leathers have to be set at one inch, anyway? It’s not a bad measurement, but for those of us who are Goldilocks riders, there isn’t a great solution without dragging out the old leather hole punch. Thirdly, if you’re adjusting your stirrups a lot, or changing out stirrups or saddles, those straps can be incredibly stiff and difficult to weave underneath stirrup bars. Lastly, despite your best efforts, they can often crack; cracked or brittle leathers are more likely to snap, and that’s not something you want to take a risk on. You can customize lengths and compensate for stretching by punching your own set of holes, and you can diligently oil and re-oil the leathers…or you can pick up a set of beta leathers. (We know it’s a confusing name, but we haven’t come up with a suitable alternative yet). Beta biothane is a durable, pliable material that’s tested to be stronger than nylon and doesn’t require oiling. None. In fact, all you have to do is rinse it off to clean. Want more exacting stirrup lengths? You can use your hole punch, or, when you buy stirrup leathers from our shop, you can request holes twice as close as the conventional sizing, allowing you to get them not too long, not too short, but just right. We’ve also got four different lengths of leather, so you aren’t stuck with a lot of extra material you don’t need. We think the choice is pretty simple. Don’t you?